Check out Peanut Butter and Jelly Cheesecake Bars. Peanut butter and jelly come together one more time! 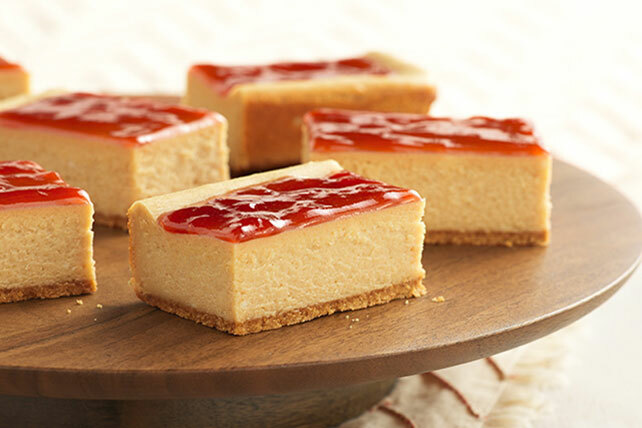 This classic pairing shares the spotlight in our Peanut Butter and Jelly Cheesecake Bars - yum! Line 13x9-inch pan with foil, with ends of foil extending over sides. Press cookie crumbs onto bottom of prepared pan. Beat cream cheese, peanut butter and vanilla in large bowl with mixer until blended. Add sugar; mix well. Add eggs, 1 at a time, mixing on low speed after each just until blended. Pour over crust. Bake 40 min. or until center is almost set. Cool completely. Spoon jam into microwaveable bowl. Microwave on HIGH 30 sec. ; spread over cheesecake. Refrigerate 4 hours. Use foil handles to remove cheesecake from pan before cutting into bars.